This option RUSHES your order into the next UPS truck! Product to East Coast in 5-6 business days, to West Coast 2-3 business days. Please call for faster UPS options 1-800-998-3331. 250w Ceramic Heat Emitter (Non-Light Emitting) @ $ 39.99 "a back-up emitter is a good idea"
Therma-Whelp Thermometer @ $4.95 "you may want a few of these"
**The stainless steel Extension Arm allows to raise the Emitter up an additional 12" inches. This is useful for weaning the puppies from the heat and for warmer whelping areas. $19.95 "you want one of these"
A wealth of information for the novice or experienced breeder! Already integrated in all new box purchases! This frame inserts into your box opening and holds the new door securely all along bottom and up both sides. Fits perfectly to upgrade your previously purchased box! ***Next DayAir, we can do that! *** 2nd Day Air, we can do that! These options require the $10 rush fee (below) plus the associated shipping charges. Up to $30 add $8.99; $30.01 to $60 add $14.99; $60.01 to $90.00; $90.01 to $120 add $24.99; $120.01 to $160 add $29.99; $160.01 to $200 add $34.99; $200.01 to $250 add 39.99; $250.01 to $300 add $45.99; $300.01 to $350 add $47.99; $350.01 to $400 add $49.99; $400.01 and up add $51.99. Welcome to your whelping outlet! For all your whelping needs. 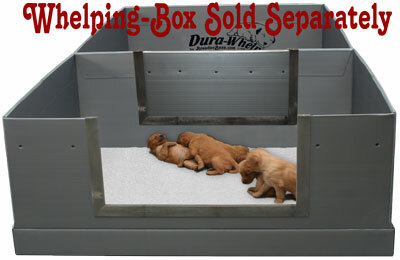 We offer the highest quality whelping box, supplies and services. Simply select the relevant category to browse our products!